Skin whitening, skin lightening and skin bleaching refers to the practice of using chemical substances in an attempt to lighten skin tone or provide an even skin complexion by lessening the concentration of melanin. Several chemicals have been shown to be effective in skin whitening, while some have proved to be toxic or have questionable safety profiles, adding to the controversy surrounding their use and impacts on certain ethnic groups. Specific zones of abnormally high pigmentation such as moles and birthmarks may be depigmented to match to the surrounding skin. Conversely, in cases of vitiligo, unaffected skin may be lightened to achieve a more uniform appearance. Long term use of skin whiteners can lead to pigmentation increasing to the joints of the fingers, toes, buttocks and ears. The skin of the face can become thinned and the area around the eyes can have increased pigmentation causing a 'bleach panda effect'. Research has shown that the use of Tretinoin (also known as all-trans retinoic acid) can only be somewhat effective in treating skin discolorations. Users of tretinoin have to avoid sunlight, as the skin can tan. Using tretinoin makes the skin more sensitive to UVA and UVB rays always. Arbutin is derived from the leaves of bearberry, cranberry, mulberry or blueberry shrubs, and also is present in most types of pears. It can have melanin-inhibiting properties. Arbutin and other plant extracts are considered safe alternatives to commonly used depigmenting agents to make the skin fairer. Medical studies have shown the efficiency of Arbutin for skin lightening. 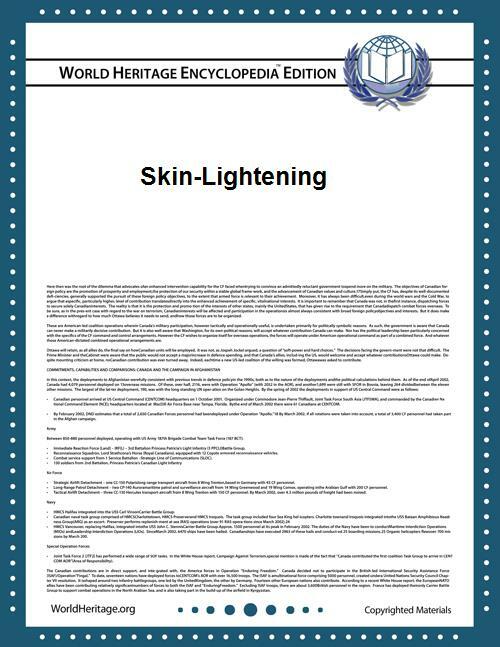 There are patents controlling its use for skin lightening. Arbutin actually exists in two conformations, alpha and beta. The alpha conformation offers higher stability over the beta conformation and is the preferred form for skin lightening indications. Vitamin C and its various forms (ascorbic acid, Magnesium ascorbyl phosphate, etc.) are considered an effective antioxidant for the skin and help to lighten skin. One study found it raises glutathione levels in the body. Another study found that brownish guinea pigs given vitamin C, vitamin E and L-cysteine, simultaneously, lead to lighter skin. Most commonly, depigmentation of the skin is linked to people born with vitiligo, which produces differing areas of light and dark skin. These individuals, if they so decided to use a lightening process to even out their skin tone, could apply a topical cream containing the organic compound monobenzone to lessen the remaining pigment. Monobenzone may cause destruction of melanocytes and permanent depigmentation. An alternate method of lightening is to use the chemical mequinol over an extended period of time. Increasingly, people who are not afflicted with the vitiligo experiment with lower concentrations of monobenzone creams in the hope of lightening their skin tone evenly. However, monobenzone is not recommended for skin conditions other than vitiligo. There is evidence to suggest that some types of skin-whitening products use active ingredients (such as mercurous chloride) and hydroquinone which can be harmful. Hydroquinone has now been banned in Europe and in many other countries can only be prescribed by a doctor for certain skin conditions. There is a growing market in skin lightening products that are toxic-free. However, they are more costly due to their expensive ingredients. Japan and the Pacific are big markets for high quality skin lightening products imported from Europe.